Below (first row, left), you see a picture of the "gay and lesbian" flag waving near the cupola of San Francisco Civic Center in 1978. It was the first time they used the symbol. From then on the rainbow became a universally recognized representation of homosexuals. 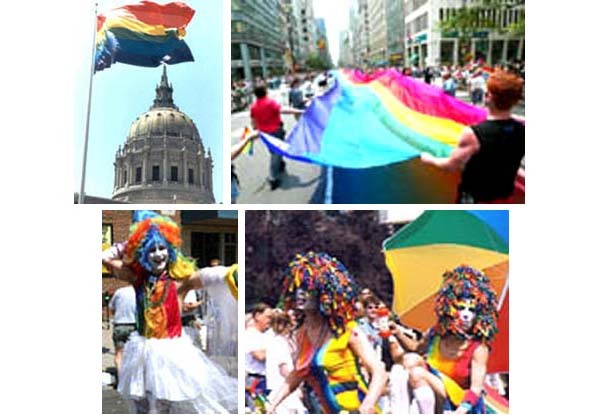 Below, first row right, in a New York City parade in 2003, they display an enormous rainbow flag. Second row left, an undefined man/woman wears a top with the rainbow colors. This motif has often been used, as was the case of the two characters in a Vancouver "gay pride parade," right. an indirect but powerful endorsement to the homosexual movement? And what about John Paul II? Didn't he know this "sign of the times"? Why did he endorse such vestments with his presence?